About Company :HCL Business Services was started in 2001 offers services to Financial, Health Care, Telecom, Retail, Manufacturing clients across the globe. 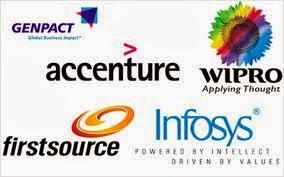 Currently HCL BPO has more than eleven thousands employees offers 24 by 7 support to lakhs of customers. Recently HCL BPO has bagged a huge order of $200 million — from Citibank to roll out new process of the bank. About Company :iEnergizer is a international BPO company offering high performance business solution to clients from10 years. iEnergizer is a strategic outsourcing partner to many big companies in the field of Finance, Banking, HR, Insurance etc. Company offer all channels of communication like Voice – Inbound & Outbound, Back-Office, Online Chat Services, Web Services etc. About Company :DigiCall Global Pvt. Ltd, a Business Process Outsourcing (BPO) company is a services and software solutions provider. However, to call it just a cost cutting center, a virtual office for your organisation is limiting its functionality. It’s your business partner that understands your needs and works towards contributing in your revenue generation..
About Company :SKN BPO is the part of SKN Bentex group which has net capital worth of 1000 crores. SKN BPO provide complete 24 by 7 customer support to B2B and B2C clients.SKN offers inbound and outbound calls in multi languages like English, Hindi and other Indian regional languages. They have a talented team of customer support specialists that easily solve queries of customers and hence increase the customer faith in the company. About Company :We manage your entire outsourcing venture to provide a hassle free outsourcing experience. Cogent E Services develops robust products for its global clientele enabling them to stay ahead and register good ROI. Our technology, people and processes are optimized to meet end-to-end product development challenges.